I bought some rhubarb on the weekend and decided to try this simple method for preserving it. 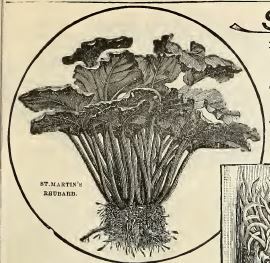 The Canned Rhubarb recipe in The New Galt Cook Book (1898) was contributed by Mrs. James Hood. I should warn you that this recipe doesn’t meet today’s home safe canning standards but I still wanted to see how it turns out and then perhaps it could be done according to modern methods. However, I didn’t want to waste good rhubarb so I’m making one jar of canned rhubarb. I washed the rhubarb and cut it into 1 inch pieces. I measured and had 2 cups. That means I need 1 cup of light brown sugar. I put some rhubarb in a jar and then added some sugar and then rhubarb and more sugar. Once the jar was full I put on the ring and lid and popped it in a large pot. I filled the pot with cold water until the jar was covered up to the neck (where the metal sealing ring meets the jar). I covered the pot and turned the heat up high and left the jar to boil for two hours. I removed it and noticed that the jar was still fairly full but the liquid only covered half the rhubarb. I opened the lid of the jar and prepared a serving for myself and then covered it again. I left the jar to cool so that I could see how it would look later. Mrs. James Hood is Margaret Ramsey. She was born about 1851 in Galt to Margaret and Andrew. When Margaret was about 21 she married James McCrea Hood in May 1872 and they had three children. I haven’t been able to find out much about her although her husband was a merchant and even the town clerk for Galt. Her husband died in 1925 but I haven’t found her death notice. The rhubarb is still intact but soft. This is a remarkable aspect to this method and perhaps why it might be followed. It is also simple (if unsafe method today) other than the hassle of opening all the jars and re-proportioning the contents. The colour of the rhubarb remains intensely red, another asset and the flavour is that wonderful combination of tart and sweet. It isn’t cloyingly sweet and that tart rhubarb flavour comes through but there is enough sweetness to make it easy to eat. I like the use of brown sugar instead of white. I imagine Mrs. James Hood serving this with some whipped cream as a simple dessert. It could also accompany some slightly stale (or fresh) plain cake. Cut the rhubarb into pieces about one inch long, wash and drain;take two measures of rhubarb to one of light brown sugar, place fruit and sugar in alternate layers in self-sealers, filling the jars as full as possible screw on the cover tight set in a boiler of cold water up to the neck, put it on the stove and boil steadily two or three hours till the rhubarb is cooked; by this time the fruit will have gone down about one-third; remove from the boiler and take the contents of two or three jars to fill up the others. Replace the covers at once and screw tight. My brother and his friends are staying over tonight on their way to Georgian Bay for a camping trip. That’s been a favourite vacationing area for people from Waterloo County for over one hundred years. I decided to make some cookies for them and limit the amount of time I had to stand over a hot stove since it is quite warm today. I selected Miss McNaught‘s recipe for Ginger Drops in the 1898 New Galt Cook Book. This is one of those recipes that someone could memorize easily as most of the measurements are the same for similar ingredients. I started by putting 1 cup butter and 1 cup white sugar in a saucepan and bring it to the boil. As soon as it boiled I removed it from the heat and added 1 cup of molasses. I left it to cool and put all the other dry ingredients in a bowl. First were the spices and leavening — 1 teaspoon each of black pepper, ginger, cinnamon and baking soda plus about 1/4 teaspoon of nutmeg. These spices would be purchased already ground although the nutmeg could be whole and then freshly grated for the recipe. I added 3 cups of flour next and blended them well. I mixed in 2 eggs and 1/4 cup of milk along with the warm liquid from the saucepan. It was easy to mix all this together since it was a rather sloppy batter. I really wonder how it will turn out. I double checked that I’d added all the ingredients before I started dropping spoonfuls of this batter onto a greased cookie sheet. I kept the cookies far apart as it is clear they will spread. I popped the pan into the oven at 375º F. for 10 minutes. They appeared baked when the time was up and as expected they had spread into each other. I left them to cool but started wondering if they would taste like my paternal grandmother’s ginger cookies. She died when I was a teenager and I’ve never been able to find a recipe that turns out similar cookies. They were flat thin cookies, and as kids we had fun rolling them up into tubes to eat as they remained soft. I can’t wait to taste them. Miss McNaught is a familiar name in this cook book. She’s Frances “Fanny” McNaught, sister of another contributor Margaret “Maggie” McNaught Young and she’s also a co-editor of the cook book. Fanny was born in Fergus Ontario in 1843. She was a teacher briefly before moving in with her sister and brother-in-law at their home “Thornhill” in Galt Ontario. She remains there until her death in 1919 of vascular heart trouble. These cookies come closest to my grandmother’s in texture but have a different flavour. I’m not sure children would like these cookies since the pepper and ginger taste is stronger than most children would enjoy. However, many grownups will like them if they enjoy molasses based cookies. I think a touch more flour would allow these cookies to have a better shape. These large flat cookies are great for the cookie jar but not the tea-table. Currently the cookies are very soft and might not even work in the cookie tin since they could end up stuck together. Perhaps if they baked a minute or two longer they would be crisp. I like them just as they are but that’s probably partly due to the memories they trigger. One cupful molasses, one cupful sugar, one cupful butter, one teaspoonful black pepper, one teaspoonful ginger, one teaspoonful cinnamon, one teaspoonful soda, a little nutmeg, two eggs, quarter cupful of milk, three cupfuls of flour. Boil the butter and sugar together and add the other things. Drop on a buttered pan and bake in a quick oven. There is something about lemons that suit the summer months. Maybe it is childhood memories of lemonade, even if it came from a can of frozen concentrate, that make me think Lemon Cake will be a nice summer treat. There are several recipes for this cake in the 1898 New Galt Cook Book and a few more for Orange Cake. I’m going to try the recipe contributed by Mrs. R. Wilkinson. I started by making the cake. I creamed 2 cups of white sugar with 1/2 cup of butter. I mixed 3 cups of white four with 2 teaspoons of baking powder before adding it alternately with the 3/4 cup of milk to the creamed mixture. I separated the 6 eggs and set aside two of the yolks for later use in the filling and whipped the whites before folding them into the batter. I greased two round cake tins and spooned the batter into them equally before baking at 350º F. for 35 minutes. While the cake baked I started on the filling. I put 2 egg yolks, 1 cup sugar, the butter in a saucepan. I grated the lemon rind and added the juice. I stirred everything and turned up the heat. I let it boil for about 5 minutes. I’m not sure if the egg yolks started to cook or just separate but it was a bit lumpy. It also wasn’t as thick as I’d expected. Perhaps I should have cooked it longer. I left it to cool along with the cakes once they were out of the oven. Eventually I spread the filling on one layer and added the next. I think I could have split one of the layers and had enough filling for that second layer. I cut a slice of my lemon cake to eat. Mrs. R. Wilkinson is Marion Picken. As usual, I used the people search feature of the Waterloo Region Generations website to get a sense of possible men with the surname Wilkinson and the first initial R. Marion Picken was born in Scotland on September 10, 1845 to John and Agnes. The family emigrated to Canada sometime between 1847 and 1849 based on the birthplaces of two of Marion’s siblings. She eventually had at least 10 brothers and sisters. Her father was a shoemaker and some of her brothers were coopers and moulders. She married Robert Wilkinson sometime before 1868 and they had four children. Robert had been born in Galt and eventually became a storekeeper. Marion died in 1912 of heart failure. I liked this cake. It is finely textured but dense. Although my lemon filling wasn’t a complete success it gives me an idea that it will blend well with the cake. I think I’ll try Mrs. R. Wilkinson’s recipe for lemon cake again. It isn’t a modern style cake which perhaps is why I like it. CAKE PART. — Two cupfuls sugar, one-half cupful butter, three-quarters cupful sweet milk, whites of six eggs, three cupfuls flour, two teaspoonfuls baking powder. FILLING. — Grated rind and juice of one lemon, yelks of two eggs, piece of butter the size of an egg, one cupful sugar. Cook till thick, and spread between the layers. As promised yesterday, I’m making pancakes today and I”ll use the syrup I made yesterday to top them. I selected an interesting recipe in The New Galt Cook Book (1898) from Mrs. Esson of Chicago. It is Rice Griddle Cakes and used leftover rice. 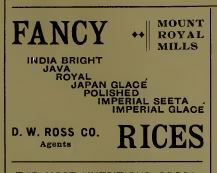 Rice Varieties advertised in The Canadian Grocer 1898. I put 1 1/2 pints (3 cups) of cooked rice in a bowl and added warm water until it was just covered. After an hour I planned to drain the remaining water off the rice but it had been completely absorbed. I started mashing the rice and then I added 1 quart (4 cups) of milk that I’d soured with 4 teaspoons of vinegar. I beat up two eggs and added them to the mix. I added the quart (4 cups) of flour and sprinkled in some salt. Once it was well mixed I started the frying pan heating before adding the 1 teaspoon of soda to the batter. A word of advice. If you are making the entire recipe, make sure you use a large bowl. My bowl was a little too small making it hard to mix. Once the pan was hot I added a little oil and then spooned dollops of the batter in the pan. Us a griddle if you have one but it works fine in a frying pan. I turned each pancake to cook on the other side and then served them on a plate. I had to spoon out the syrup to top the pancakes since I’d stored it in the fridge. I was ready to taste! Mrs. Esson is challenging to find in Chicago. There are Essons in Waterloo region based on Waterloo Region Generations but I haven’t connected them to Chicago or narrowed down the possibilities of all the Essons in Chicago in 1898. However, I think I have the most likely possibility. Katherine Anabella Campbell was born to Mary Victoria Allen and John McDiarmid Campbell in Guelph in 1880. She lived in Berlin Ontario when she married Scottish born James Leonard Esson. He listed his residence as Chicago on their marriage register. As an accountant he could move anywhere and so the couple lived in several places during their marriage. They had one daughter Ruth Anabella who was born in 1904 when they lived in Chicago. Later they moved to New York and Katherine travelled outside North America and died in Monaco in 1957. However, after researching all this I’ve suddenly realized that Katherine can’t be the right Mrs. Esson of Chicago as she didn’t marry James until 1903 — far too late to be in a cook book published in 1898. 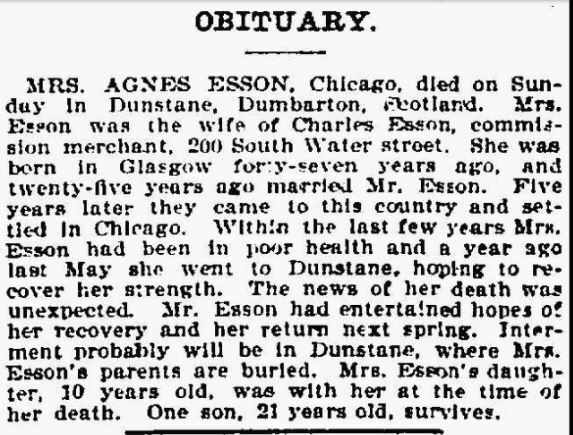 Now I’m not sure how to find the Mrs. Esson of 1898 in Chicago. Obituary for Agnes Risk Esson. However, using the Chicago Blue Book of 1891 I found that Mr. and Mrs. Charles Esson lived in Chicago. They are the parents of James Leonard Esson so this means they are connected to Waterloo through him. Charles Esson married Agnes Risk. Charles was born in Halifax Nova Scotia and ended up in Scotland as an apprentice. He married a Scottish resident Agnes Risk and they had their first two boys were born in Scotland. 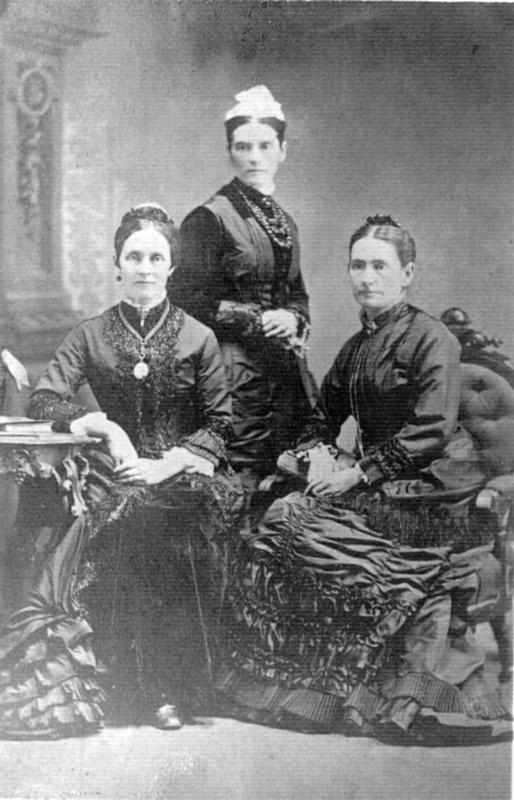 They came to the United States sometime in the early 1880s and their third son and only daughter were born in Chicago. Sadly Agnes died while on a return visit to Scotland. Her obituary is attached. It appeared in the Chicago Tribune in 1899..
I’m not quite sure of the point of rice griddle cakes but they are edible. The rice gives a different texture to the pancakes that is interesting but it is not going to appeal to everyone. The taste was fine and will depend on the type of rice used and the amount of salt used to cook it and then added to the batter. I’d expected the pancake to be a bit crisper because of the rice but it was softer. I suppose if you want to reduce the amount of wheat flour you consume than this could be a good way since about half the amount of flour is replaced by the rice. This is also a good way to use up leftover rice. Cooked rice can’t be kept long even with refrigerators but it must have been challenging to store in 1898. One and a half pints cold boiled rice, one quart sour milk, one light quart of flour, soda, two eggs, salt to taste. Soak the rice an hour in warm water enough to cover it. Mash the rice well, and make a batter, just before using it, with the milk, flour, salt, eggs, well beaten. The batter ought to be moderately thick. Stir in a teaspoonful of soda, just before frying. Fine batter cakes may be made of stale light bread; trim off the crust, soak the bread, and make it by the above recipe. 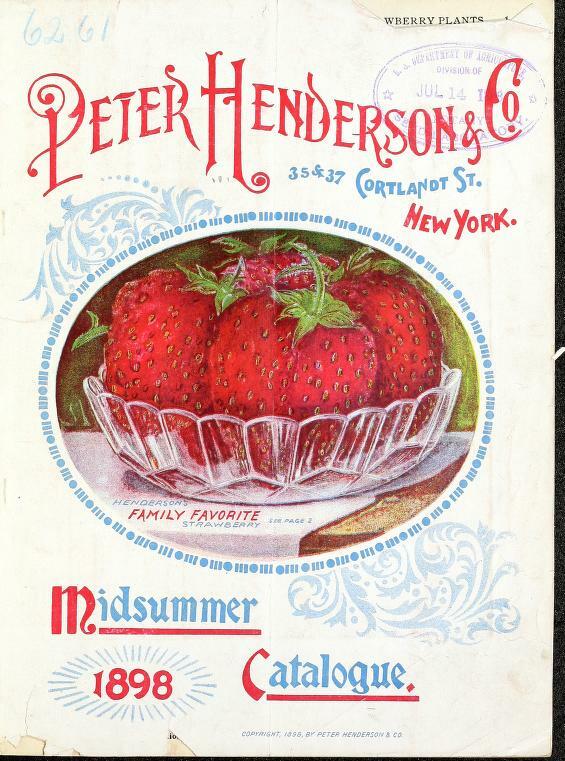 I try to consume as many local strawberries as possible during their brief availability so I’m trying the Blanc-mange Strawberries recipe in the New Galt Cook Book (1898). The recipe comes from Mrs. A. Taylor and it looks quick and simple which is an asset since I got home from work at 8:30 tonight. Each brand of granulated gelatine has a different size of envelope I discovered tonight. The box of Davis gelatine contained 5 envelopes that were .40 ounce while Knox had four .30 ounce envelopes. I highly recommend weighing your gelatine because with larger amounts it will make a difference. Both boxes say that one envelope will set 2 cups of liquid but I decided to use the 1/2 ounce so I added a bit from another envelope of gelatine. I sprinkled it in 1 cup of warm water, stirred and left it 10 minutes to dissolve while I measured the other ingredients. I put 1 pint (2 cups) of cream in a saucepan. I used whipping cream since that’s what I keep on hand for these recipes but I think any sort of cream would work in this one. I weighed the 1/4 pound ( 3/4 cup) sugar and added it to the pan too. Finally I stirred in the dissolved gelatine and started heating it on low and then slowly turned up the heat. The gelatine package says not to boil so it explains the instruction not to boil. When the cream mixture began to simmer I removed the pan from the heat and left it to cool. The next task was preparing the strawberries. I hulled and sliced them and placed them in a glass bowl. I sprinkled some sugar on top and left it to sit while the cream mixture cooled. At last it was time to pour the blanc-mange over the strawberries and dish out some for myself. Mrs. A. Taylor is Margaret “Maggie” Fisher. She was born in Scotland in 1849 to Alexander and Georgina. They brought her to Canada when she was about five. The family lived in Galt but Alexander must have died just a few years later as he doesn’t appear in the 1861 census. Maggie married Alfred Taylor sometime between 1871 and 1877. He was a dry goods merchant. They had three children but only their daughter – another Maggie — lived a long life like her father (89 years) while her oldest brother died of pneumonia when he was nine and her other brother died of appendicitis at 25. Mrs. A. Taylor died in 1929 when she was 79. So what exactly is blancmange? Perhaps French speakers can tell us if this is really a French word. Basically it is a milky gelatine. I’ve heard of blancmange for years but never eaten it. The idea of this dessert reminds me a bit of one I had in Thailand which is made with cocoanut milk and agar – a thickener made from a plant rather than an animal. It was served with lychee fruit. A modern vegetarian cook could probably make Mrs. A. Taylor’s recipe using agar instead of gelatine. However, the reality, at least the way mine turned out, is quite different. My blancmange was liquid not solid. I don’t know what I did wrong if anything but I ended up eating strawberries with sweetened cream. This is pleasant but not what I expected. I wonder if the problem is my gelatine. There are several other blancmange recipes so hopefully I’ll figure it out soon enough to enjoy with strawberries. If you don’t live in a place with strawberries try it with the soft fruit (berries) available in your area. UPDATE: This worked after all! In my impatience last night I must not have let it set long enough. Today it is firm and jelly like and tastes pretty good. The texture is smooth and not as gross as I expected. Dissolve half an ounce gelatine in a cupful of water, add to it one pint cream and one-quarter pound sugar, heat it till nearly boiling, let stand till nearly cold, pour over your berries which you have sugared and placed in a glass dish. Looks very pretty and tastes nice. I worked today and had a speaking engagement tonight so now I’m trying to figure out which recipe to select from the 1898 New Galt Cook Book. I stopped at the grocery store on the way home and they finally have local strawberries so I bought some and have decided to make Preserved Strawberries. 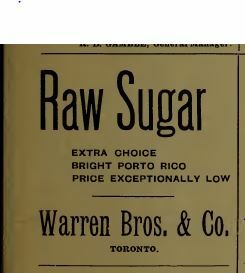 The recipe was contributed by Mrs. Robertson of Woodstock. I decided not to make very much of this recipe in case it didn’t work well. I hulled some strawberries filling a cup. I kept the strawberries whole and weighed them. I had 6 ounces of strawberries so I needed 6 ounces of sugar. Both went in a small saucepan on low heat. It is amazing to watch sugar melt. The berries leached out some liquid too. Once the sugar was liquid I turned the heat up higher and it started boiling so I began timing it. The strawberry smell was wonderful. I cut the time short when the liquid began to thicken a lot. I spooned the strawberries into a jar and kept boiling the rest of the liquid for a few minutes. I skimmed off the foam and then poured the liquid into the jar. I took a sample before sealing the jar. Mrs. Robertson is still a mystery since there are a number of possible married woman in Woodstock with the surname of Robertson. 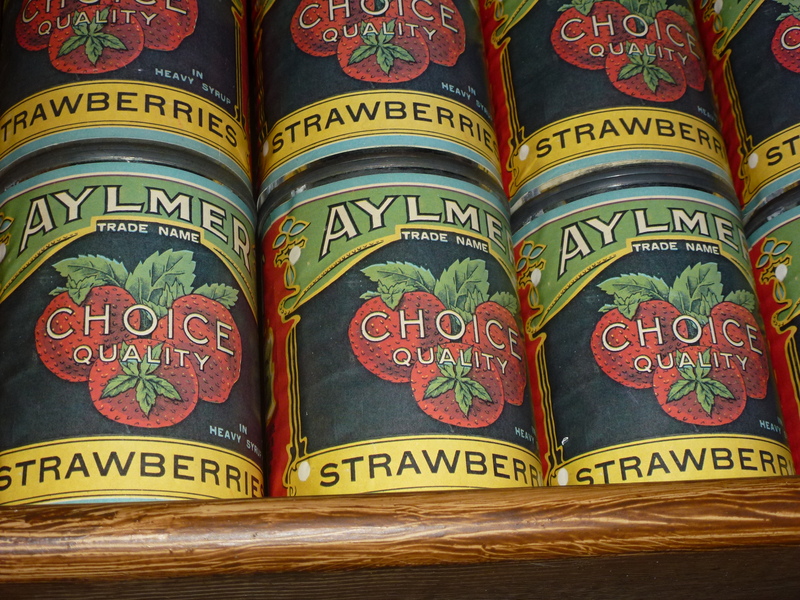 Reproduction cans of strawberries displayed in the Dry Goods and Grocery Store at Doon Heritage Village. This is a classic preserve. People have been making this whole fruit style of preserving for a very long time. It is hard today to imagine how important these preserved strawberries were in a time without frozen or year round availability of this special fruit. By 1898 they were being preserved commercially in cans and jars but home canning would continue for many years. I’m not sure this recipe meets today’s safety standards so you can make a small amount and store it in the fridge. Allow pound for pound sugar and fruit, put in a preserving kettle together over the fire till the sugar melts. Boil twenty-five minutes, fast. Take out the fruit in a perforated skimmer and fill your jars three quarters full. Boil and skim the syrup five minutes more, pour it over the fruit, filling the jars. Seal up hot.